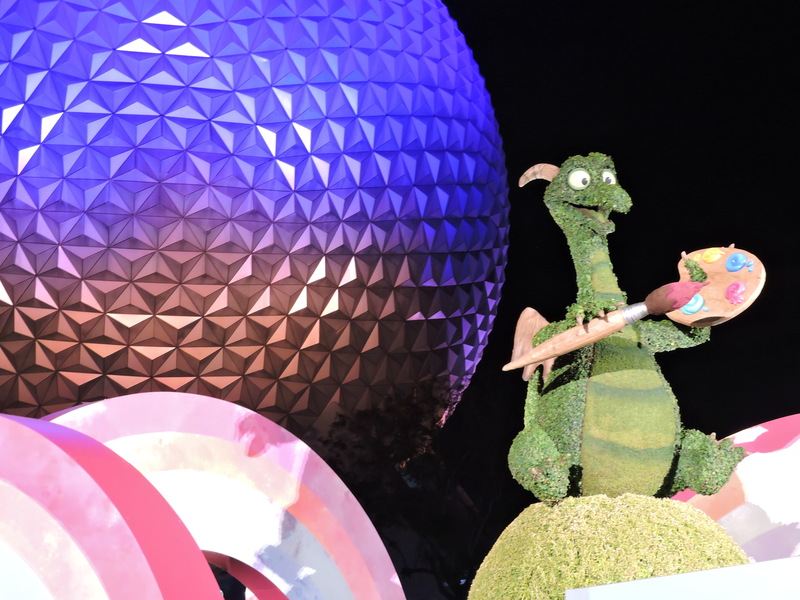 Walt Disney envisioned Epcot as the “Experimental Prototype Community Of Tomorrow.” But with his death, it became just another attraction in the Disney parks system. 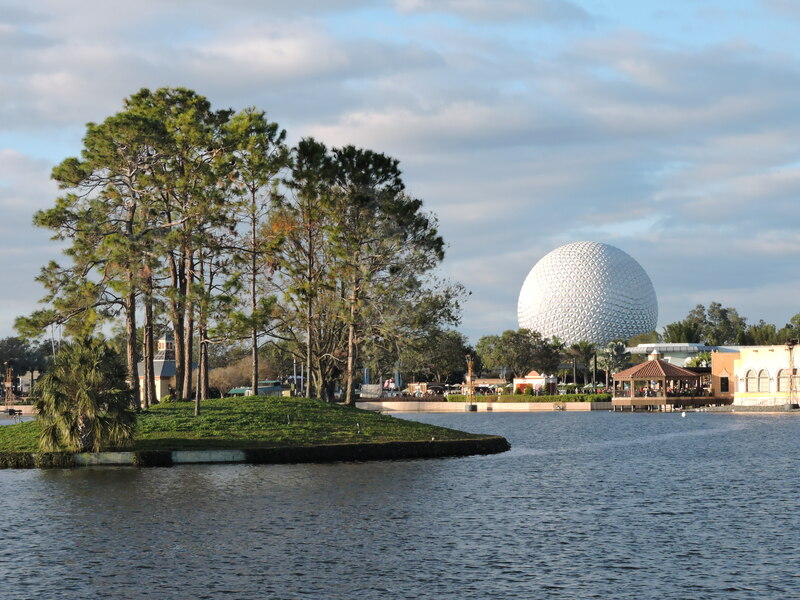 The large dome seen is “Spaceship Earth” and contains a historical exploration of innovation. “Future World East” and “Future World West” were to focus on modern science and technology with a view to the future, although they too have an amusement park feel. 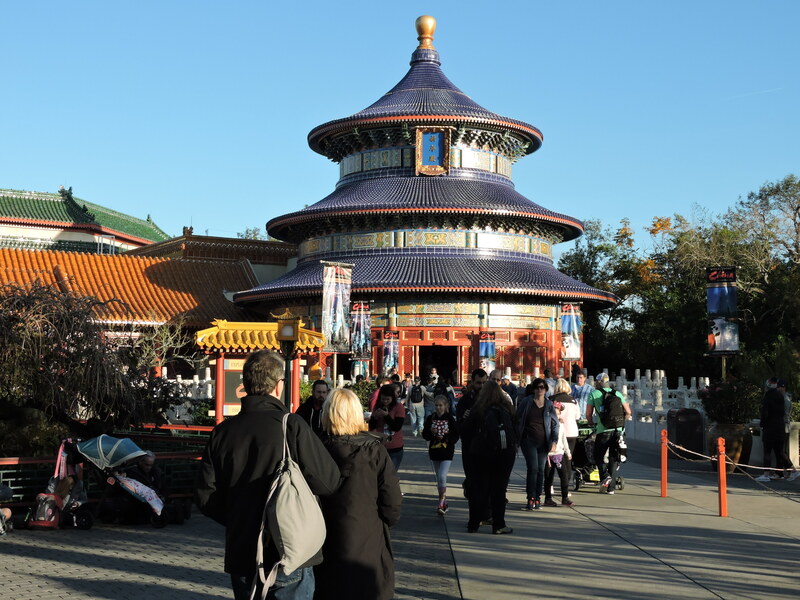 Paths open out to “World Showcase” where exhibits reflect the culture and history of the U.S. and ten other countries: Mexico, Norway, China, Germany, Italy, Japan, Morocco, France, United Kingdom, and Canada. Each country exhibit features a film or amusement ride reflecting mostly American stereotypes of that country. There are many places to eat and buy souvenirs, also reflecting U.S. preconceived images. But perhaps I am too harsh. Most visitors have not had the good fortune to travel as we have. We haven’t been to mainland China or Morocco, but otherwise have seen the real thing. Arriving when the gates opened at eleven and wanting to see the fireworks at nine p.m., I was sure we would have more than enough time to do everything we felt like. That is not to say the park isn’t fun. We visited many years ago and were looking forward to seeing it again. But our expectations were low. As the title suggests, we had a great time and ran out of time. Here is a quick synopsis of what we did. In Future World East, we played with color, testing our ability to produce a desired color. After looking at super-magnified images of items like a butterfly’s wing – the cellular structure is amazing, we used “rope magnifiers” [sort of a lens on a flexible tube that reveals images on a monitor]. We looked at the items they had on display and then turned the magnifiers on our own bodies – which may not have been a good thing. I rode through “Test Track by Chevrolet” which was a bust both as a ride and education until it burst out of the building on a track as fun as most roller coasters. We looked at art as described in last week’s post. 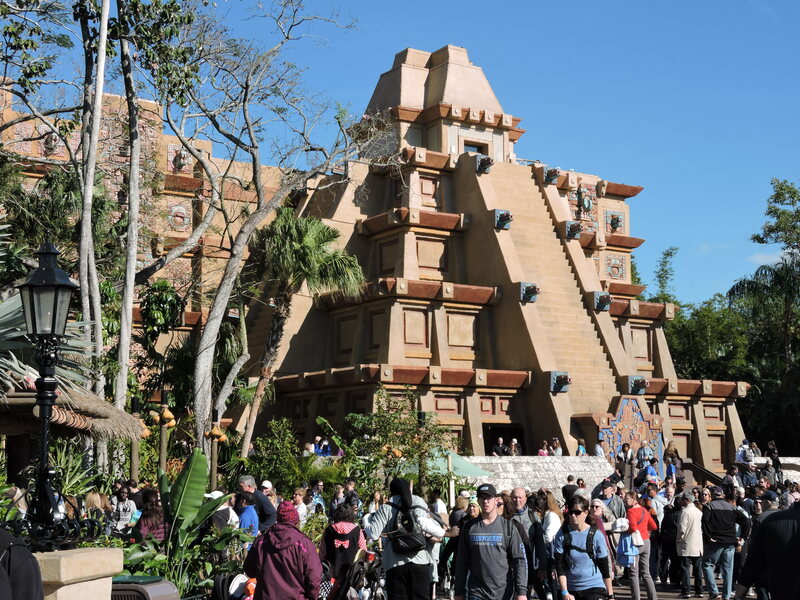 We took a boat ride in Mexico: If you have been to a Disney park, think “it’s a small world” in serapes and sombreros. We rode “Frozen Ever After” in Norway, a boat ride based on Disney’s film Frozen. 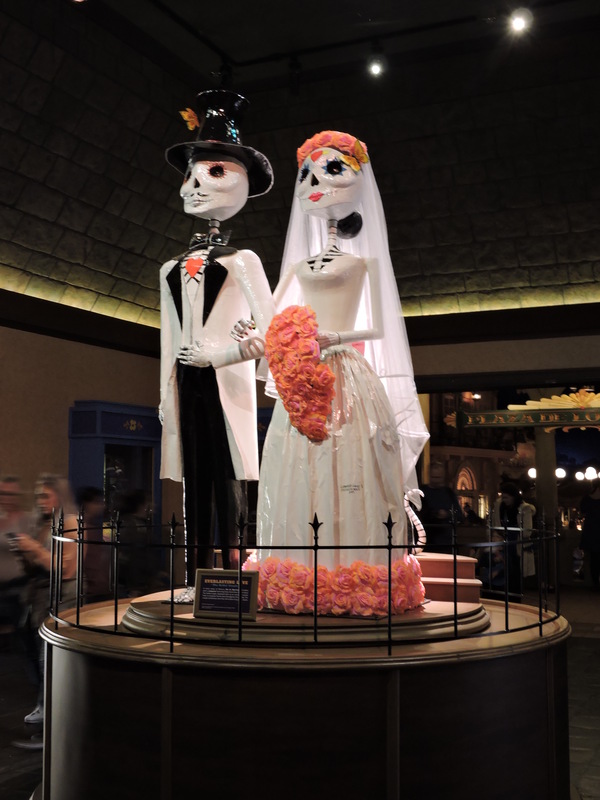 It was so poorly done, Walt must be groaning in his grave [perhaps an idea for a Disney haunted house]. Note, if you are seeing something based on a popular Disney film, be sure to use a “fast pass” to shorten your wait. I did enjoy the three hundred and sixty degree film showing the sights of China. It had been updated since we last saw it and went way beyond the mandatory views of the Great Wall, terra-cotta army and Forbidden City. Similarly, I enjoyed the film on France which showed much more than the Eiffel Tower. We went back to the Chinese pavilion to see a mind-boggling performance by acrobats before rushing back to Future World West where I had memories of the days when “Imagination” was sponsored by Kodak and featured a dragon called “Figment.” It was closed, so we went on a ride based on Finding Nemo. Unlike the Frozen ride, it was done well with 3-D images, but what we really enjoyed was its huge aquarium. I had to drag Alie away from the fish to see the fireworks display: Illuminations: Reflections of Earth in the center of the World Showcase lake. I love fireworks. These were excellent fireworks augmented by huge bursts of flame whose heat could be felt across the lake. Furthermore, a giant revolving globe moved out under the fireworks. On the various continents were projections of people and animals from those places. We were there in January, and it was not extremely crowded. In fact, by the end of the day, the aquarium viewing areas were nearly empty. We had free tickets, but the promotion was unconnected to Disney, so I have no qualms saying, we could have easily filled another day. This entry was posted in Travel Logs and tagged Amusement Parks, Epcot, Florida, Orlando, Orlando Florida, Travel, Walt Disney World. Bookmark the permalink. 8 Responses to Epcot proves me wrong. One of the most fun and educational things we did at Epcot was first take the Living With The Land boat cruise through the hydroponic gardens and then take the Behind The Seeds walking tour through the back of those gardens. It is amazing what they can grow with hydroponic technology. We were walking clockwise around the park and did not make it to that area until the park was about to close and then only got into the aquarium. But I do remember it from years back and would be interested to see it again. Figment was my daughter’s absolute favorite when she was little. He was still there when we visited in 2016, and even as a teenager, she was still delighted by that ride. I’ll be so sad if he’s gone for good. The old ride in Norway was a travel promotion with a ‘scary’ troll at the end…loved that ride because it was cool few minutes of relaxation and there was never a line, lol. What I enjoy most in the World Showcase pavillions is talking to some of the people that work there..a lot of students from the country sponsoring the pavillion. Also, the Land should have Soaring (it was closed for renovation last time we were there)…love that ride. It’s very popular, so fast pass. Then after Soaring, we hit the tour through the hydroponics area. I’m 73 and still like Figment. He is still there, but it was too late in the evening when we got to that exhibit.